Just a few years ago rents were 43 percent cheaper in the Seaport. Now the average rent is $52.92 per square foot, less than 1 percent below the average in the Back Bay. In many ways, Boston’s Innovation District is far behind the Back Bay as a commercial hub. It does not have a signature building such as the Hancock Tower or an iconic civic space like Copley Square. Though new restaurants have moved in, its retail mix is virtually nonexistent compared with the eateries and boutiques that line Newbury and Boylston streets. Yet in one key way the Seaport is beginning to measure up: Rents have surged to the same level as those in the tony Back Bay — making both districts the most expensive office markets in the city. Just a few years ago rents were 43 percent cheaper in the Seaport. Now the average rent is $52.92 per square foot, less than 1 percent below the average in the Back Bay, according to commercial real estate firm Cassidy Turley. Not only is the landscape of the city’s commercial real estate market changing, but so too are the forces driving it. A number of technology and information companies have moved into the historic warehouses of the Innovation District in recent years, driving up rents and fueling construction of new office buildings along Seaport Boulevard and Northern Avenue. 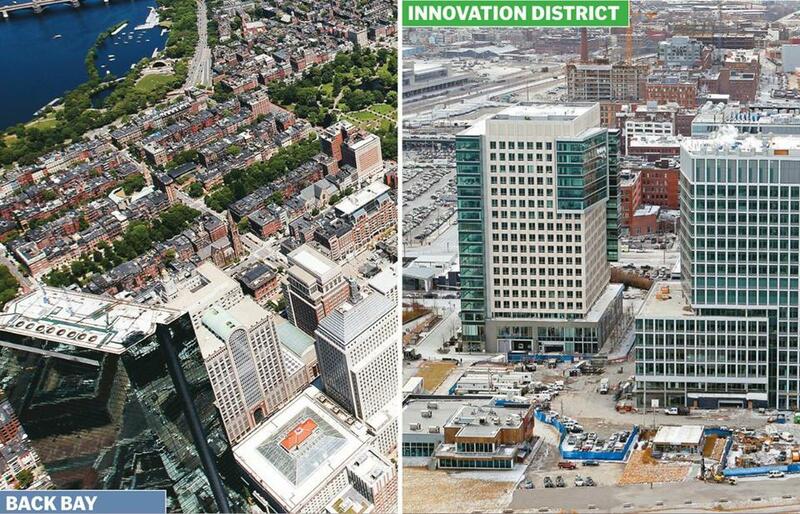 By the time the current wave of building is completed, the Innovation District will rival the Back Bay in the total size of its office market. It will also have a comparable list of corporate tenants, with new homes for State Street Corp., accounting giant PricewaterhouseCoopers LLP, and law firm Goodwin Procter. In some respects, the district’s recent rise in rents is something of a double-edged sword. The increase will help developers finance construction of expensive new buildings, but it will also make it more difficult for the small firms that have driven the district’s growth to continue to move there. Even so, the Seaport’s attractiveness has helped to fuel a broader recovery of Boston’s commercial real estate market following the economic downturn. For example, technology companies that cannot find space in the area are instead moving to the adjacent Financial District. The most prominent example is Internet commerce company PayPal Inc., which moved to International Place. Since then, several other growing companies have leased space in the district, adding firms such as IdeaPaint Inc., CloudHealth Technologies, and the business software company Leaf. The influx has caused many real estate executives to rethink the area’s moniker as a financial hub. Boston added about 52,000 jobs through November of last year, one of the strongest increases in recent memory. Much of the jump was due to the medical and technology companies that are moving to the city or expanding their offices, a trend property owners hope will continue in 2014. Commercial real estate specialists said many of those firms opted to move into the Innovation District’s repurposed warehouses and other Class B office space downtown. While rents for that kind of space increased by 20 percent, top-rated space is seeing more modest increases, making it harder for to finance construction of new buildings. Still, several developers are constructing preleased towers for firms that could not find what they were looking for in existing buildings. He added that discussion about speculative building is also beginning to crop up.